Welcome to iPhone 101 where we're kicking off the new year for new iPhone owners with an all new, all basic how to series. If you're a beginner, worry not, we've got you covered. If you're a seasoned pro, but keep fielding support calls from friends and family new to the iPhone, we've got you covered as well -- just send them to us! 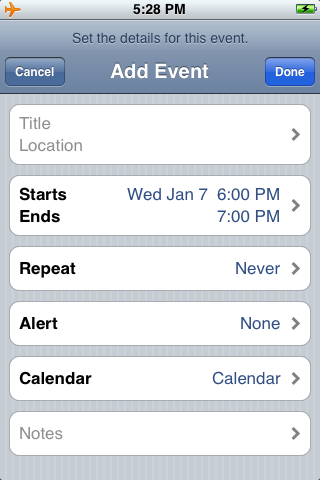 This time around we're adding calendar events. 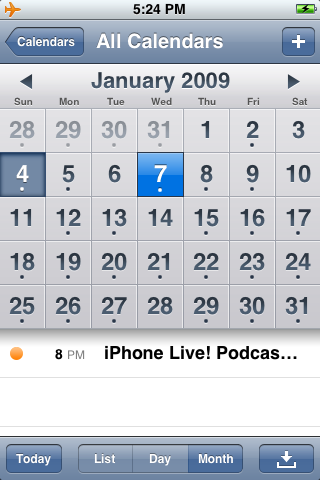 While you might already be syncing your appointments via Exchange ActiveSync or Apple's MobileMe, or from Outlook or iCal via iTunes, sometimes you may just be out and about and need to add that just-came-up event to your iPhone's calendar directly. Fret not, we'll show you how... after the break! From the homescreen, tap on the calendar icon. Depending on how you last left it, you'll be greeted by either the List, Day, or Month view. You can add an appointment from any of them. 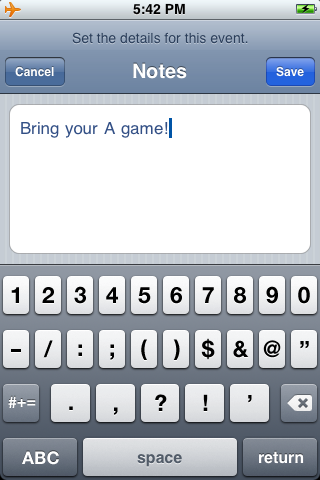 To start, tap the "+" (plus) button at top right to call up the "Add Event" screen. IMPORTANT: The iPhone doesn't automatically store information as you type it, you absolutely have to hit the "Save" button or you will lose your data. Continue down, tapping on the additional fields to fill them out. 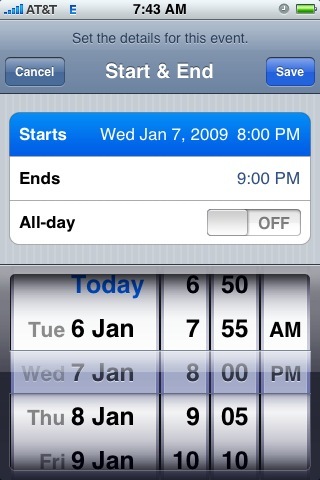 "Start" and "End" times will default to 1hr apart, but you can change either of them to reflect the actual time and duration, or you can toggle the "All-day" slider to "on" to float the event on top of your other appointments (birthdays, for example, typically default to "All-day" events. Repeat lets you choose common frequency levels for events that you do on a daily, weekly, monthly, or yearly basis, and you can easily set custom repetitions as well (every Monday, Wednesday, and Saturday, for example). 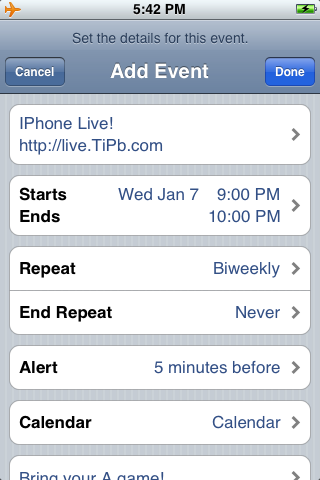 Alerts let you choose to have the iPhone popup a reminder for you, and how long before the event you want that reminder to pop up. If you're only going online or down the hall for a meeting, maybe 5 minutes is enough. If you have to drive across town in traffic, you may want 1 or 2 hours! If you have multiple calendars, you can also choose on which color-coded calendar you'd like your new event to appear. Family, work, training, etc. can all hold different events. 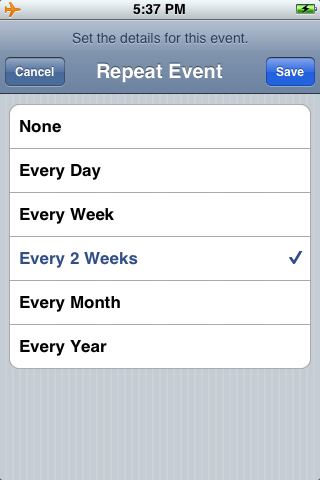 (We'll cover creating custom calendars in a future iPhone 101). Lastly, you can jot down any Notes, like conference call-in numbers, documents you need to bring, booking references, etc. When everything is entered and the event is just to your liking, hit "Done" at the top right and your new appointment will show up in your calendar. 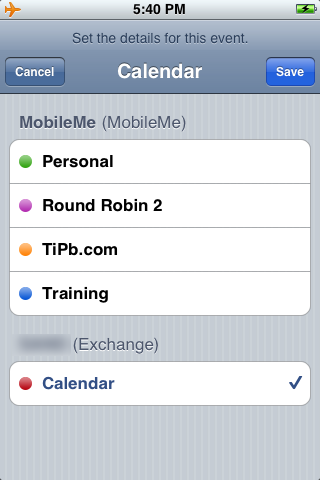 If you're syncing over the air to Exchange or MobileMe, the iPhone will push out the new appointment near-instantaneously. 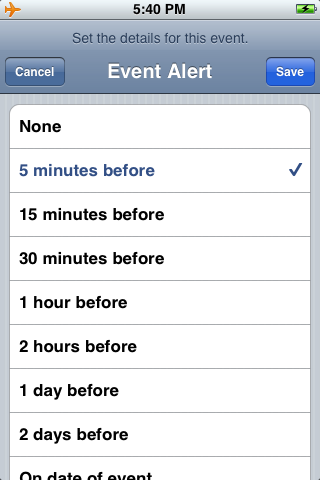 If you're syncing via iTunes, it will transfer the appointment over next time you attach the USB cable. Now you've done it, you've added an event directly on your iPhone. Let us know how it worked for you, and if you have any other tips for new users, please drop them in the comments!